At Ruppel Dentistry, we're dedicated to helping patients in and around Tampa get the most effective care available for optimal oral health and great-looking smiles at every age. As a top-ranked general & cosmetic dentistry practice in the Tampa area, our entire team is focused on our patients' needs. Dr. Cory Ruppel, DDS, and Dr. Solveig Matheson Ruppel, DDS, are board-certified professionals, skilled in all areas of preventive, restorative and cosmetic dentistry techniques so patients can feel confident they'll always receive the highest-quality care. Both doctors earned their doctoral degrees in dental surgery at the prestigious Northwestern University Dental School in Chicago, followed by additional post-doctoral in academic and clinical settings. 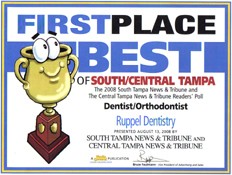 Today, Ruppel Dentistry is proud to be a leading provider of general & cosmetic dentistry for men, women, children and teens throughout the Tampa region. From general and preventive services including checkups, x-rays and cleanings, to restorative care solutions including root canal therapy, dental implants and bridge placement, to aesthetic options like Invisalign, one-hour Zoom! whitening, and porcelain and tooth-colored crowns and veneers, Ruppel Dentistry is dedicated to serving the individual needs of every patient. Recognized as a leading provider of state-of-the-art cosmetic dentistry techniques aimed at helping our patients create more attractive smiles. General & Preventive dentistry services aimed at helping our patients enjoy healthier teeth and gums and more beautiful smiles. Our dental provides our patients the most advanced options to repair and restore teeth that have been damaged or lost due to decay or trauma. A new smile will change your life. See our before and after patient cosmetic photos or contact us for a free consultation. "Staff was knowledgeable, hospitable, courteous, helpful. They explained everything including service and price prior to doing any work. All services were as promised in price and quality." "Dr. Ruppel and his team were great. Very professional. It's amazing they were able to complete my crown and whitening all in the same morning. The technology they use to make the crown on site is awesome. My mouth is sooooo happy!" 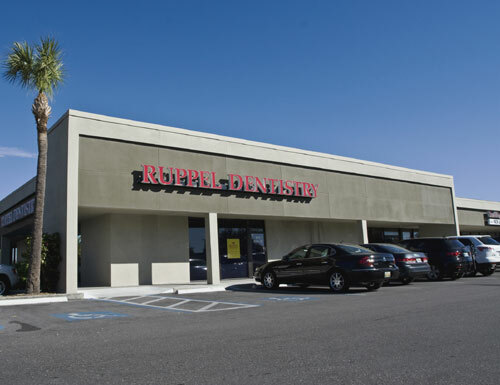 At Ruppel Dentistry, we pride ourselves on being a leading provider of general & cosmetic dentistry solutions for patients throughout the Tampa area, offering a broad array of care options for patients of all ages. Our entire team is skilled in preventive and restorative options like routine and deep cleaning to prevent periodontal disease, fluoride treatments to strengthen teeth, tooth-colored fillings to treat decay, safe and effective treatments for baby bottle tooth decay, and advanced root canal therapy for teeth that have been extensively damaged by decay or trauma. Plus, our South Tampa office is equipped with state-of-the-art diagnostic options like intraoral cameras and laser cavity detection to identify issues in their earliest stages. In addition, we also offer specialized restorative options like natural-looking bridges, crowns and implants to help you maintain a great-looking smile at every age, and treatments for tempomandibular joint disorder (TMJ or TMD) to help patients rebalance their bites and avoid chronic pain issues. In addition to preventive and restorative dentistry treatments, we also offer a full range of cosmetic dentistry services to help you enjoy a more beautiful smile, including options like natural-looking porcelain crowns and veneers, popular Invisalign® orthodontic treatment and Zoom! one-hour whitening to help you feel more confident about your smile. At our South Tampa practice, our patients are our #1 priority, and every general and cosmetic dentistry treatment plan is customized for each patient’s unique needs and treatment goals for the best possible results. Having a healthier, better-looking smile is just a phone call away. Call today to schedule your consultation.